As Summer fast approaches, the United Kingdom is preparing to book those long awaited holidays and transform their skin from pale and pasty to sun kissed and gold. With the risks of using sun beds being more widely publicised, many of us are turning more and more to fake tan products as the healthier, safer option. 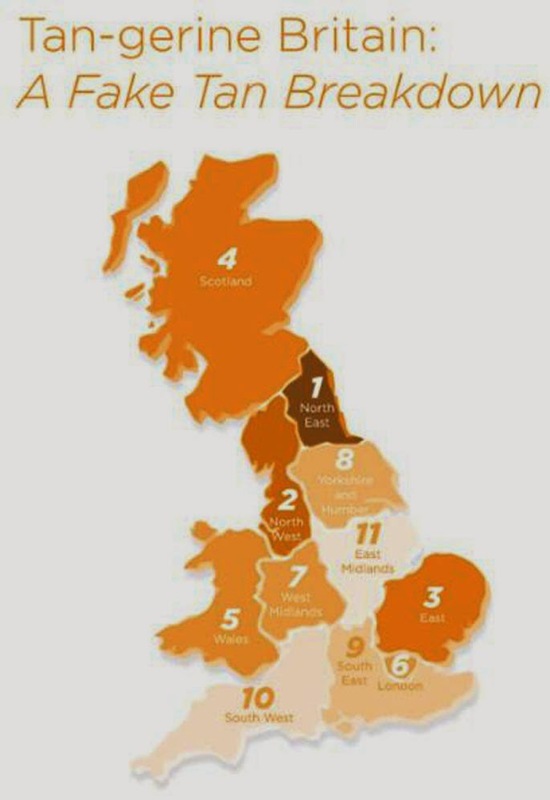 The "orange" look is still wildly popular across much of the UK (as the map shows), with the top fake tan region being the North East. Vouchercloud carried out a research exercise of the most popular tanning related searches and what geographical location those tanning searches were carried out in. ‘It was with some amusement in our office that we realised the north-east was by far the main area for fake tan related searches,’ said Mr Wood. There are lots of fake tanning products on the market today and trying to decide which one to choose can be daunting. I have tried many in the past and finding one that does not streak and is easy to apply can seem like a mission. I came across Cocoa Brown whilst browsing online one day and it is the answer to all my fake tan issues. Easy to apply - check, Non- Streak - check, Rich in colour but non orange - check. Cocoa Brown is created by Irish lass, Marissa Carter and is a revolutionary, innovative collection which was ultimately created to address the lifestyle needs of women and men. It all started with the 1 Hour Tan product which is a mousse tan that develops just one hour after application into a beautiful, natural looking tan and lasts for five days. Ideal for last minute plans and nights out. There is nothing worse than having to put on the wash off stuff when on most days you are likely to run into a little bit of rain - not pretty on the ol' legs when your sun shimmer starts to run! With a first of a kind formulation, the product combines hi tech accelerating agents, which are activated upon contact with skin and speed up the tan’s absorption and development, to deliver a rich, cocoa brown tan. The value of the products are remarkable and came as quite a surprise to me, the 1 Hour Tan is only £7.99 which is a bargain compared to some other products on the market which start above £15. The results are just as good if not better than major players such as St Tropez and Fake Bake. It is no surprise that Cocoa Brown has been a recent award winner at the RSVP Beauty Awards! Other products include: Night & Day Tan, Lovely Legs, Tough Stuff Scrub and Gentle Bronze which is a developing daily tan. I see orange people all over the uk! The map is funny though, pretty accurate.